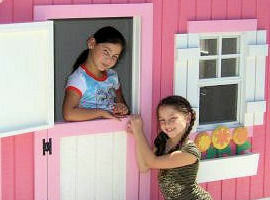 When you were a kid did you have your own playhouse... clubhouse... tree house? Or was one of your friends the lucky one? Do the memories still make you smile? I have a lot of fond memories of the treehouse my father built for me in our backyard. I loved that treehouse, and I enjoyed it for many years of my childhood. So did my friends, who loved to come and play at my house.